An in vitro rapid blood assay has been shown to differentiate between bacterial and viral infections with significant sensitivity and specificity, outperforming routine biomarker and laboratory tests. The diagnostic test is described online in the journal PLOS ONE. Because bacterial and viral infections are often clinically indistinguishable from one another, this can lead to inappropriate use of antibiotics (both overprescribing for viral infections and underprescribing for bacterial ones). 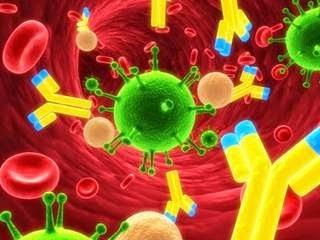 The ImmunoXpert diagnostic test extensively screens for immune system proteins in patients with acute infections to identify viral-induced host proteins and bacterial-induced proteins. Additional testing determined that the optimal immune signature included three proteins: TNF-related apoptosis-inducing ligand (TRAIL) and interferon gamma-induced protein-10 (IP-10), which were upregulated in viral infections; and C-reactive protein (CRP), which was upregulated in bacterial infections. Respiratory viruses were responsible for most cases of community-acquired pneumonia among hospitalized children, and one in four children studied had multiple pathogens, according to a study published in the February 26 issue of the New England Journal of Medicine. The new findings may redirect clinical decisions and prescriptions, according to one expert.